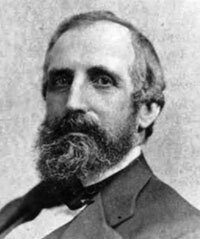 In the hope of making his fortune, William Sargent Ladd left New York City on February 27, 1851 for points west. His original destination was gold-rush era San Francisco, but the Oregon Territory, where there would be less competition, appealed to him. He arrived in Portland with a shipment of liquor which sold quite briskly, and soon expanded his shop’s offerings to include local produce. Portland, at the time, had a population of about 800, but that number would grow quickly like Ladd’s fortunes. William S. Ladd went on to invest in and found several businesses, including a bank, a steam navigation company, an iron works, and a railroad. He also accumulated vast land holdings, including big chunks of Southeast and Northeast Portland and Lake Oswego. Ladd’s Addition, of course, was one of his parcels. William S. Ladd platted the development in 1891, two years before his death, but development did not take place until 1907.